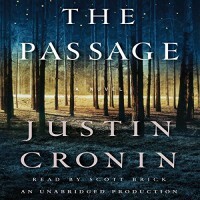 Having just re-read The Passage, via audio book, (in preparation for reading the third book which was released back in May), I am sticking with my original rating and opinion of the story. I'm not even sure why I read The Twelve when I didn't really enjoy the first book, (this book), very much. But I did, and I liked The Twelve MUCH more than this one. Now, a few years later, when I saw that City of Mirrors, (the third book in the trilogy), was coming out, I thought I would familiarize myself with these characters once again. I made a bad decision. It happens. I wish I had chosen to listen to The Twelve instead. Even though I did enjoy the narrator, Scott Brick, this tome seemed just as long and boring as it did the first time around. Seriously, it feels like I've been listening to this book for months now and I'm just thankful that it's over. That said, I am still looking forward to reading City of Mirrors. I'm keeping my fingers crossed.